• Interest income from loans grew 7% to total $306.19 million relative to $287.27 million in the same period of 2017. • Interest income receivables went down 74%, amounting to $380,677 (2017: $1.47 million). Interest expense totaled $24.58 million relative to $24.45 million in 2017; this represents a 1% rise. As a result, net interest income grew by 7% to total $281.99 million (2017: $264.29 million). Net interest income for the quarter amounted to $85.15 million (2017: $72.23 million). Commission expense went up 4% to $3.40 million (2017: $3.26 million), while service fees of $1.85 million were reported (2017: nil). In addition, foreign exchange gain totaled $523,116 in 2018, compared to $934,543 in the prior year. As such, gross profit amounted to $281.10 million in 2018, 7% rise relative to that of $261.95 million. However for the quarter, gross profit climbed 22% to $84.40 million (2017: $71.05 million). • Staff costs amounted to $114.11 million (2017: $104.97 million). • Allowance for credit loss totaled $35.76 million (2017: $23.30 million). • Depreciation was $5.41 million (2017: $5.33 million). • Other operating expenses amounted to $79.67 million (2017: $78.37 million). Profit before taxes totaled $46.15 million (2017: $49.98 million), following taxes of $2.53 million versus tax credit of $12,018 in 2017. Consequently, net profit for the period amounted to $43.63 million relative $49.99 million in 2017, a 13% decrease. Net profit for the quarter amounted to $17.24 million (2017: $19.36 million). As a result, EPS for the period closed at $0.42 (2017: $0.48). 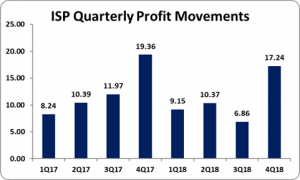 The EPS for the quarter was $0.16 (2017: $0.18). The number of shares used in our calculations is 105,000,000 units. Notably, ISP closed the trading period on March 29, 2019 at a price of $ 15.50. As at December 31, 2018, ISP reported total assets of $612.54 million, a 21% increase when compared to $507.69 million in the prior year. ‘Property, Plant and Equipment’ and ‘Loans net of provisions for credit losses’ contributed to this increase closing the period at $25.51 million (2017: $18.07 million) and $551.10 million (2017: $437.51 million), respectively. Shareholders’ Equity as at December 31, 2018 was $320.39 million compared to a $286.27 million in 2017. This resulted in a book value per share of $3.05 compared to $2.73 the prior year.